Quantum calculations are performed using the PC GAMESS program. It is not included in the package. Please download it from the manufacturer's site and transfer pcgamess.exe and DLLs to the Ascalaph/GAMESS folder. The GAMESS panel can be opened in the Tools > PC GAMESS menu or by pressing the toolbar button . Not all GAMESS functionality is available in the graphical interface. Only the main functions are supported. However, full GAMESS functionality is available using the input file. First, the input file can be generated without starting GAMESS (Tune button) and edited, after which GAMESS can be started from command line. Second, GAMESS can be started from the graphical interface using pre-edited input file (Start button). Similar to pressing the Run button, constitutive pressing the Tune and Start buttons launches the task but allows to edit the input file in between. 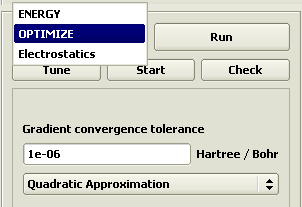 The calculation mode can be selected in the upper left list. The options applicable to the selected mode are shown in the panel below. It is recommended to press the Check button prior to calculation start (Run button). This initiates a rapid dummy calculation, which allows to detect many problems. Insufficient memory is the most common problem. In this case, the memory reserved for gamess should be increased (in the lower right Memory box).